When it comes to the study of planets, moons, and stars, magnetic fields are kind of a big deal. Believed to be the result of convection in a planet, these fields can be the difference between a planet giving rise to life or becoming a lifeless ball of rock. For some time, scientists have known that has a Earth’s magnetic field, which is powered by a dynamo effect created by convection in its liquid, outer core. Scientists have also long held that the Moon once had a magnetic field, which was also powered by convection in its core. Previously, it was believed that this field disappeared roughly 1 billion years after the Moon formed (ca. 3 to 3.5 billion years ago). But according to a new study from the Massachusetts Institute of Technology (MIT), it now appears that the Moon’s magnetic field continued to exist for another billion years. The study, titled “A two-billion-year history for the lunar dynamo“, recently appeared in the journal Science Advances. Led by Dr. Sonia Tikoo, an Assistant Professor at Rutger’s University and a former researcher at MIT, the team analyzed ancient lunar rocks collected by NASA’s Apollo 15 mission. What they found was that the rock showed signs of a being in magnetic field when it was formed between 1 and 2.5 billion years ago. The age of this rock sample means that it is significantly younger than others returned by the Apollo missions. Using a technique they developed, the team examined the sample’s glassy composition with a magnometer to determine its magnetic properties. They then exposed the sample to a lab-generated magnetic field and other conditions that were similar to those that existed on the Moon when the rock would have formed. This was done by placing the rocks into a specially-designed oxygen-deprived oven, which was built with the help of Clement Suavet and Timothy Grove – two researchers from MIT’s Department of Earth, Atmospheric and Planetary Sciences (EAPS) and co-authors on the study. The team then exposed the rocks to a tenuous, oxygen-free environment and heated them to extreme temperatures. From this, they determined the lunar rock became magnetized in a field with a strength of about 5 microtesla. That’s many times weaker than Earth’s magnetic field when measured from the surface (25 – 65 microteslas), and two orders of magnitude weaker than what it was 3 to 4 billion years ago. These findings were quite significant, since they may help to resolve an enduring mystery about the Moon. Previously, scientists suspected that the Moon’s magnetic field died out 1.5 billion years after the Moon formed (ca. 3 billion years ago). However, they were unsure if this process happened rapidly, or if the Moon’s magnetic field endured, but in a weakened state. The results of this study indicate that the magnetic field did in fact linger for an additional billion years, dissipating about 2.5 billion years ago. In other words, this new timeline of the Moon casts some doubt on the theory that a lunar dynamo alone is what powered its magnetic field in the past. 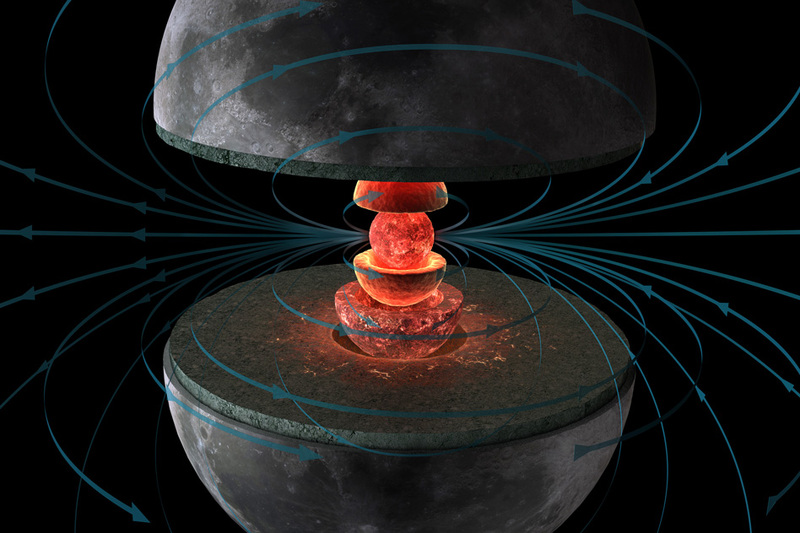 Basically, it is now seen as a distinct possibility that the Moon’s magnetic field was powered by two mechanisms. Whereas one allowed for a dynamo in the core that powered its magnetic field for a good billion years after the Moon’s formation, a second one kept it going afterwards. In the past, scientists have proposed that the Moon’s dynamo was powered by Earth’s gravitational pull, which would have caused tidal flexing in the Moon’s interior (much in the same way that Jupiter and Saturn’s powerful gravity drives geological activity in their moons interiors). In addition, the Moon once orbited much closer to Earth, which may have been enough to power its once-stronger magnetic field. These findings were made possible thanks in part by the availability of younger lunar rocks. In the future, the researchers are planning on analyzing even younger samples to precisely determine where the Moon’s dynamo died out completely. This will not only serve to validate the findings of this study, but could also lead to a more comprehensive timeline of the Moon’s geological history. The results of these and other studies that seek to understand how the Moon formed and changed over time will also go a long way towards improving our understanding of how Earth, the Solar System, and extra-solar systems came to be. Exciting results, since they hint at long lived geodynamos and goes towards explaining Earth’s such. Likely not, but a hefty field can be the difference between a habitable planet and a runaway greenhouse like Venus. A strong geodynamo magnetic field protects the upper atmosphere from the solar wind, which else sputters hydrogen from UV hydrolyzed water into space. The eventual water loss removes the ocean and CO2 scavenging erosion and you likely enter a Venus analog runaway. In Venus case there is also a question about initial water content and plate tectonic role, et cetera. It is complicated, but it points to a possible correlation between an active planetary core, water content, as well as crust, mantle, and core composition, and the potential for plate tectonics. That in turn decides the surface temperature, erosion rate and nutrient turnover, which on Earth is believed to have upped and prolonged biosphere productivity.